The current chapter focuses on the role of inflammasome in cancer prevention and development. 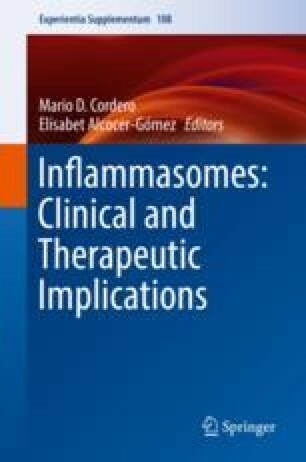 Emerging evidence suggested that inflammasome is closely correlated with elevated levels of IL-1β and IL-18, activation of NF-κB signaling, enhanced mitochondrial oxidative stress, and activation of autophagic process in cancer. Meanwhile, inflammasome component NOD-like receptors (NLRs) are also involved in carcinogenesis and closely correlated to chemoresponse and prognosis. Although several lines indicated the duplex role of inflammasome in cancer development, the phenomenon might be attributed to NLR difference, cell and tissue type, cancer stage, and specific experimental conditions. Designation of inflammasome targeting strategy has become a novel tool for cancer prevention or treatment. This work was supported by the National Natural science Foundation of China (81573651, 81703749 and 81703764), Guangdong Science and Technology Department (2016A030306025), Pearl River S&T Nova Program of Guangzhou (201506010098), Combined Scientific Project Funded by Guangdong Provincial Science and Technology Agency and Guangdong Provincial Academy of Traditional Chinese Medicine (2014A020221047), Guangdong Highlevel university construction project (A1-AFD018161Z1510, A1-AFD01817Z11102, A1-AFD01817Z11101), Guangdong High-level Personnel of Special Support Program (A1-3002-16-111-003) and The PhD Start-up Fund of Natural Science Foundation of Guangdong Province, China (2017A030310213).